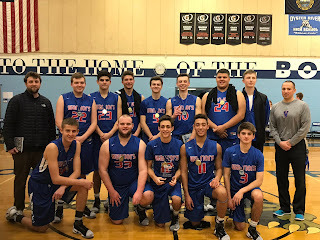 In a game between two of the best teams in the NHIAA, Winnacunnet trounced seacoast rival Spaulding 62-44 on Wednesday night in the finals of the Oyster River Holiday Tournament. 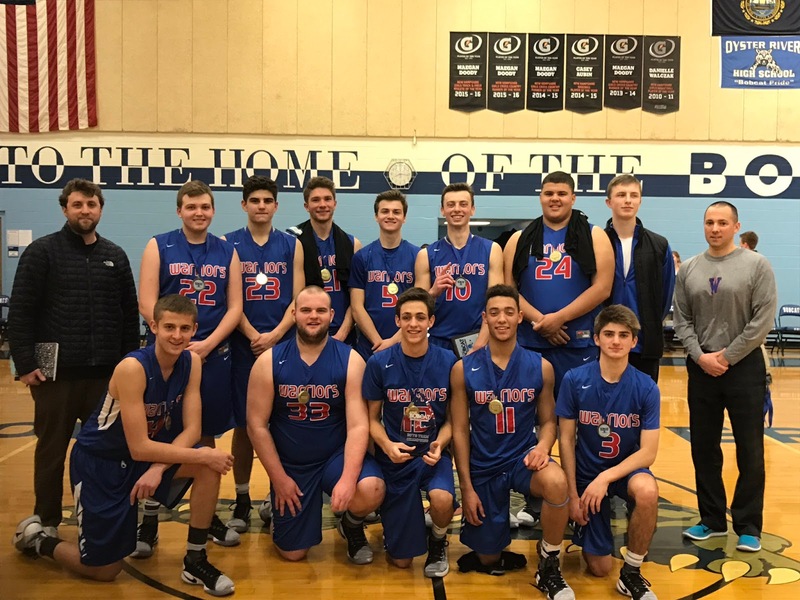 The Warriors were led by tournament MVP Liam Viviano, who had 10 points, 8 assists, 4 rebounds and 3 steals. "They're a good Division I team" said Viviano. "I know they didn't have their best player, but we didn't have one of our better players either. We still beat them by 20. I hope this puts fear in people's eyes." Spaulding's best player Cal Connelly has missed the past two games with the flu, while Winnacunnet sophomore forward Jack Schaake is expected to be out for a few weeks with an ankle injury. Viviano had an excellent all-around game - pressuring people on 'D', hitting 3's. Most impressive was his passing, as Viviano served up a number of high level dishes which led to baskets. He showed the ability to score the basketball, but even better was his ability to create offense for his teammates. "I think Liam is the best point guard in the state" said Winnacunnet head coach Jay McKenna. "He has grown as a point guard a lot in his three years on the varsity team. His passing has gotten better - he has good vision and the ability to find the open man. I don't think he scored a point for us last game, yet he's the tournament MVP - that speaks volumes." The first great pass Viviano made was early in the 1st quarter, threading the needle with a no-look pass to senior forward Freddy Schaake for a layup. Moments later Viviano drained a 3-pointer. "The first couple of games this season I had my head down, but since then I've been picking my head up, looking for my teammates more - no we're blowing teams out" said Viviano. It was close early on, as Logan Keene made a nice block on 'D' for Winnacunnet, while Isiah Rose (11 points) hit a 3 and Arie Breakfield (game-high 15 points) finished in transition off a good spin move. Rose is only a freshman, but his 3-pointer was very smooth, he showed good form on the shot. He also had some athletic drives to the rim. Breakfield has good size at 6-foot-4 and an inside/outside game. The Red Raiders have a good young core with Breakfield and point guard Keagan Calero (both sophomores) and Rose, a freshman. After the 3 by Viviano, Breakfield made a nice pass to Calero cutting to the hoop for a layup. Zach Waterhouse countered for Winnacunnet with a 3-pointer from the left wing. Breakfield found the gap in the Warriors' 2-3 zone defense, flashing to the high post and hitting a turnaround jumper from the foul line. On the other end Keene showed some good effort on a put-back. Waterhouse pulled down an offensive board and dished it to a cutting Keene who lunged towards the basket for an and-1. That was a good finish by Keene. Spaulding had an early 5-2 lead, but Winnacunnet closed the quarter on a run. It was 14-9 Warriors after 1. Schaake made a good steal early in the 2nd quarter, taking it in for the transition layup. Winnacunnet quickly regained possession, with Viviano making a nice pass to sophomore wing Ben Allen for a layup. The Warriors continued to have success with their press, as they got another steal - Schaake dished it to senior wing Michael Lamprey for a fast-break layup. Then Lamprey got the ball on the wing, had plenty of time to set his feet and get the shot off from beyond the arc - the shot was good. Spaulding needs to challenge those shots. It was 23-9 Winnacunnet. "I thought our effort in the 1st half was lackluster, especially on defense" lamented Spaulding head coach Tim Cronin. "They outhustled us for every loose ball and rebound. The other thing was we had too many turnovers vs. their press." Right after Lamprey hit that 3, the Red Raiders came back and got a 3 of their own from Calero (12 points). Calero is a tough point guard who is always looking to attack the defense. On the next trip down Rose buried his second 3 of the 1st half, as Spaulding cut the lead to 23-15. Viviano made a good dish to Schaake for a layup. Calero drilled another 3, this one from the right wing. It was 29-18 Winnacunnet at halftime. Spaulding senior Matt Roy was doing the dirty work inside, working hard for a put-back early in the 3rd quarter. Breakfield converted a put-back as well - the Red Raiders are back in it, now only down 29-23. Then Winnacunnet took control of the game back, going on an 11-2 run. Warriors senior guard John Cadagan connected on a 3 from the top of the key. Winnacunnet got a quick steal, Viviano made a nice dish to Allen for a layup. Cadagan drained another 3 - he has an unorthodox shooting motion, but it goes in. Viviano continued to show good quickness off the dribble - he drove towards the rim and made a nice dish to Lamprey for a layup - that was a good finish by Lamprey and made it 40-25 Warriors. Rose took a charge on 'D' - great to see a freshman taking a charge! Allen drove baseline and hit a teardrop. Winnacunnet led 42-30 after 3 quarters. Viviano drilled a 3 from the right wing early in the 4th - nothin' but net. It was now 45-30 Warriors. Breakfield answered back on the other end with a 3 from the right corner. Calero cut to the basket, got the pass and made the layup. Spaulding got the ball right back, Calero drove into the lane and hit the floater. Breakfield again found that gap in the Winnacunnet 2-3 zone, flashing to the foul line and hitting the turnaround jumper from the elbow. That cut the Warriors' lead to 49-39 with 4:43 left in regulation. Winnacunnet responded with a 13-3 run to put the game away. Viviano led the break, the Warriors had a 3-on-2 break, Viviano made a good dish to Schaake (11 points) for another layup. Then Viviano made yet another nice pass, this time to Keene. Keene's layup made it 60-41 Winnacunnet with 1:03 remaining. Both teams empied their benches at that point. "I thought Lamprey came off the bench and gave us great minutes" said Coach McKenna. "Mike Fiacco had a nice tournament for us. Seth Provencher gave us some good minutes - he's a niche player, he sets good screens. The two best teams in the state right now are on the seacoast - Portsmouth and Winnacunnet.